1995 Hobie Classic Malibu by Phil Edwards 9 ft 1". FIN: fin box but no fin fitted. Purchased Surf Dive and Ski, Miranda Fair, Sydney 17th February 1997. 1. "Interview with Phil Edwards" Surfer magazine July 1964 pages 22 to 25. Longboard magazine Vol 3 # 5 December/January 1995 pages 34 to 43. 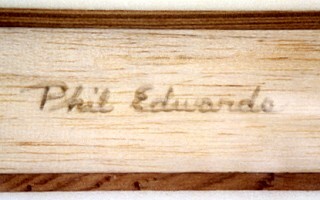 Phil Edwards, Cottons Point, circa 1960. Stern and Cleary, page 166.